This photo of aircraft carrier USS Harry S. Truman is incredible—and it looks like a lot of fun too. I imagine the helmsman pushing the rudder and whispering "wowwheeeee!" According to J.D. 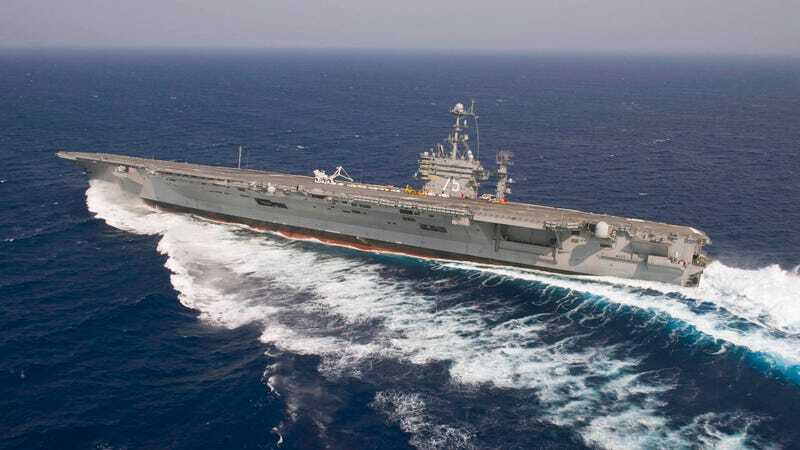 Levite—our intern and ex-US Navy sailor who spent nine years on one of these carriers—"it's like a car skid, they ramp the carrier up to full power and then push the rudder to make it turn. That sort of turn usually results in a 10-15 degree list. It's not much compared to small ships that'll list 40-50 degrees, but huge for a carrier." It is! Everything on the deck has to be tightly secured for this operation. Otherwise it would fall off into the water.